New Delhi, Jan 24 : The leader of separatist National Socialist Council of Nagalim (NSCN), Isak Chishi Swu arrived in Delhi from Bangkok, and for the first time on an Indian passport. He was felicitated by the Naga Peoples' Movement for Human Rights (NPMHR), where he thanked the Indian Government. 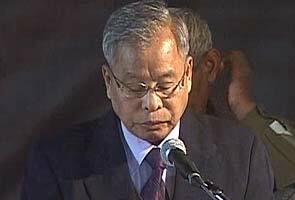 He is expected to go to Nagaland for an important meeting later. Earlier he had a Bangladeshi passport. Sources said the Centre had inked certain restrictions in Swu's Indian passport, to which the outfit was objecting. Interlocutor for the Naga talks, R.S. Pandey, will hold parleys with the militant leaders. Talks between Naga leaders and Indian are at an advanced stage.